Tree nuts and peanuts are eaten around the world over and seen as a convenient, tasty, snack that contributes to a healthy lifestyle. They also come cholesterol-free and full of nutrients, including protein and fibre. However, it is a sad fact of life some people may never get to enjoy nuts because they have an allergic reaction to eating them. 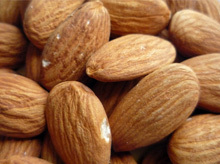 Almonds can be eaten on their own, either raw or toasted. They are often sprinkled over food with other nuts, particularly ice cream dishes. These particular nuts are a rich source of Vitamin E containing 24mg per 100g and are a high source of Calcium. It is a well-known fact that almonds along with other nuts should be avoided if you are on a diet to lose weight, this is because nuts come high in calories and fats. However, it would appear that this fact may not be true. A study was carried out by experts at the Purdue University USA on 20 women between the age of 25 to 30 with BMI counts higher than normal. The test consisted of 10 women being supplemented for a 10-week period with 2 servings of almonds per day. Each serving of almonds contained 300 calories, the other ten participants did not receive a diet supplemented with almonds. After a ten week period the situation was turned around, and those who had had their diet supplemented with almonds had them stopped. The 10 women who at first had no almond supplements now received them for a period of ten weeks. Overall results of the study showed that women in the almond supplementation group did not experience hunger during the 10 week period and no change in their weight, BMI or body fat was found. It would appear the results of the test proved that almonds do not cause an increase of weight, in fact, the very opposite was found the almonds had kept the individual from experiencing hunger during the day, cutting the problem of overeating. 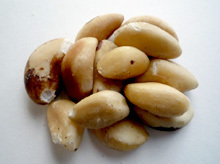 Brazil nuts are an excellent source of Selenium, and a good source of Magnesium and Thiamine. The Brazil nut is actually a seed. In its natural form it is contained in hard pods which are round or pear shaped very similar to that of a coconut. The pod contains between 10 or 20 Brazil nuts, extremely popular in both the US of A and the UK after shelling the nuts can be ate raw, roasted or salted. The Brazil nut has a high selenium content. Selenium is also a powerful antioxidant making the nut/seed very popular to the health and cosmetics industries alike as well as being used as a lubricant for clocks. It is also used in the making of artists’ paints. The antioxidant has been said to stimulate the immune system and slow the aging process and protect against heart disease and certain forms of cancer. Brazil nuts are high in minerals including zinc, and magnesium and contain useful amounts of phosphorous, copper and iron. Like all nuts, Brazil nuts are an excellent source of protein and fibre. The fat contained in the nuts is healthy polyunsaturates, but care should be taken with these fats if you are on a diet. Macadamia nuts according to American nutritionist Dr. Amy E. Griel. Apparently researchers found that eating just a small handful of the nuts a day reduces total cholesterol, low-density lipoprotein cholesterol (bad cholesterol) and triglyceride levels. Macadamia nuts also contain flavonoids and vitamin E potent antioxidants which help protect against cancer and heart disease. 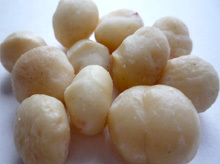 Macadamia nuts are highly nutritious. They have the highest amount of monounsaturated fats of any nut. They also contain 9% protein, 9% carbohydrate, 2% dietary fibre, calcium, phosphorus, potassium, sodium, selenium, iron, thiamine, riboflavin, and niacin. One way to enjoy this nut is in a cake, especially for those who have a problem eating nuts on their own. How does macadamia nut and coconut sponge cake with lime cream cheese topping, or Apricot almond cake with rosewater and cardamom sound to you? If this has given you appetite for more then this link to the BBC food recipes website is for you..
Walnuts are high in calories and while they’re an excellent source of mono unsaturated fats and omega-3 fatty acid, along with pecans and chestnuts they have the highest antioxidant content of the tree nuts. Although nuts have been considered a no-no if you’re on a diet, it has been proven to be miss founded. Eating nuts two, or three times a week can actually aid a diet. Walnuts can serve as a great addition to your diet. 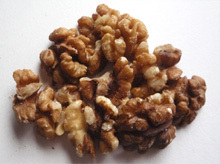 Because of their high concentration of omega-3 fats walnuts have often been thought of as brain food. Walnuts help protect against heart disease and are a good source of omega 3 fatty acids. It is also documented that walnuts improve cholesterol profile in individuals with Type 2 Diabetes. Walnuts have a high antioxidant content which can help fight against cardiovascular and coronary heart diseases. Walnuts/nuts should replace some other high-fat food in your diet. Pistachio nut eating is now recognised by experts to be rich in nutrients that reduce hardening of the arteries which is considered one of the the main causes of heart attacks, strokes and heart disease. This makes them ideal as a quick snack, when used as part of a healthy eating plan. Across the pond in USA. 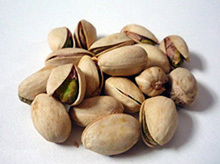 researchers at Pennsylvania State University carried out a study led by Dr. Penny Kris-Etherton on the humble pistachio nut. Volunteers were asked to supplement a low-fat diet with pistachio. One group snacked on 1.5 ounces of the nuts a day, another group had double that amount while a third group had none. After a one month test period researchers found a marked reduction in the cholesterol levels of those groups that had eaten the pistachios nuts. The results, published in the American Journal of Clinical Nutrition, showed levels of low-density lipoprotein – the ‘bad’ type of cholesterol – dropped by 11.6 percent after a few weeks in those eating two portions of pistachios a day. Nuts are an excellent way to get vitamins such as folic acid, niacin, vitamins E and B6, as well as minerals like copper, magnesium, selenium, zinc, phosphorus, and potassium. Americans are encouraged by experts to eat a variety of foods every day to get all of our needed nutrients. Nuts fall into a food group which consists of; meat, poultry, fish, dry beans, eggs and of course, nuts. Two to three foods from this group may be eaten per day. The likes of almonds, brazil nuts, cashews, hazelnuts, macadamia nuts, pecans, pine nuts, pistachios, and walnuts are classed as tree nuts. Nuts on a whole are very nutritious, and as already mentioned, provide us with many of the essential vitamins and minerals. However, having said all that, you should remember that they’re also high in carbohydrate and oils, and should not be eaten in excess of the recommended guidelines. Of course, its a bit of a bind if you like nuts and find that you have an allergic reaction to them, especially if your allergy to them is always severe. A severe reaction to nuts is called anaphylaxis shock and can be life-threatening. Tree nut allergies occur mainly, but not exclusively, in children. Although we tend to class them as nuts, peanuts are actually legumes and not true nuts. They do however still cause allergic reactions due to the proteins being very similar to that of true nuts. If you do suffer from nut allergy symptoms they may show themselves within one hour. However, it is possible for the reaction to start within minutes of coming into contact with nuts. If this were to happen then it would become an emergency situation which would require immediate attention and treatment with epinephrine/adrenaline injection. Your mouth and lips might start to tingle. You may feel sick or nauseous. Your face may start to swell. You may experience pains in your stomach similar to having colic (Stomach complaint generally found in babies a few weeks after birth). For me to give extensive information on nut allergies would be rather foolish as I’m not a doctor and only have basic knowledge of what this allergy is capable of. If you do suffer from this complaint and you are looking for guidelines, then the following website may be just what you are looking for: www.patient.co.uk (I am not too sure if the UK medical information on nut allergy is the same in the USA. or other countries, so please be aware that the link goes to a UK website.) Having said that I suppose people are people the world over and that goes for allergies also.